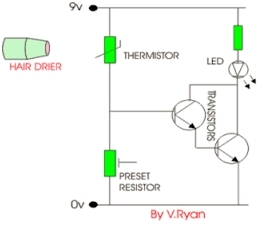 Check the last part of Nasir’s tutorial on Circuit Breakers. The next tutorial from him will be on Control Systems! For a prolonged protection of the circuit the perfect choice of the circuit protection device and its proper installation is very necessary. So here we are discussing another type of circuit breaker known as the Polyfuse Circuit Breakers. It would be a bit justified, if they would be classified as a type of fuse, but since they do not need any replacement after each time an excessively large amount of current passes through them, so we broadly classify them under the category of circuit breakers, as it is the property of circuit breakers that they do not need any replacement. However, the circuitry of poly fuse circuit breakers is a bit different from the construction trend followed in the construction of the normal circuit breakers. They also differ in their working principle from this trend. What is a Poly Fuse Circuit Breaker? So firstly, I am going to explain what basically a poly fuse circuit breaker is? They are neither fuses nor circuit breakers when it comes to their physical construction. 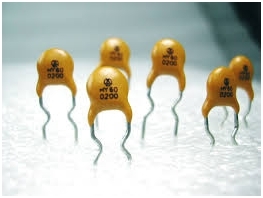 In fact, they are thermistors with positive temperature coefficients. Thermistors are very small temperature sensors, made up of carbon. They work on the principle, that their internal resistance varies with the change in temperature of the environment where they are installed. Thermistors are usually negative temperature coefficient devices, that is, their resistance decreases with the increase in temperature. But when it comes to Poly fuse circuit breakers, they are thermistors with positive temperature coefficients. That is, their resistance increases with the increase in temperature. Now the question is that how does a Poly fuse circuit breaker works? In normal conditions, when the prescribed amount of current is passing through the circuit, that is, the current range lies in the safe limit, the poly fuse circuit is at the room temperature. At this temperature, the carbon molecules in it form long chains which conduct the current through them, forming a low resistance conductive path. When anywhere any fault occurs in the circuit, such that an excessive amount of current tries to pass through the circuit, the temperature rises due to the heat produced due to the large amount of current. 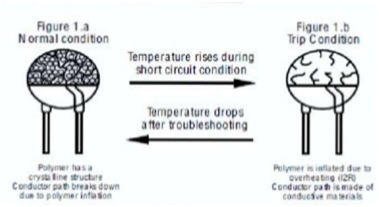 This rise in temperature increases the resistance of the thermistor inside, transforming the crystalline structure formed by the carbon atoms into an expanded amorphous form. Hence with the increased resistance of this structure, it does not allow the large amount of incoming current to pass through it, and this condition of the Poly fuse circuit breaker is known as the trip position, as it does the same function in this position, which the usual circuit breakers do in their trip states. Afterwards when the current returns to normal value, the resistance decreases again, carbon molecules realign themselves, and the path of current flow is restored. They do not need any time to time replacement, hence economical. They are very small in size, so form a very compact circuitry, hence easier installation. A very large and reliable life time. or copy this trackback: http://engineering.electrical-equipment.org/electrical-distribution/polyfuse-circuit-breakers.html/trackback from your own site. Nice topic! But my question is can we use polyfuse for high voltage? ?